Is Florida State really considering a move to the Big 12? "How do you not look into that option?" asked Andy Haggard, chairman of Florida State's board of trustees, to Warchant.com. "On behalf of the Board of Trustees I can say unanimously we would be in favor of seeing what the Big 12 might have to offer. "We have to do what it is in Florida State's best interest." 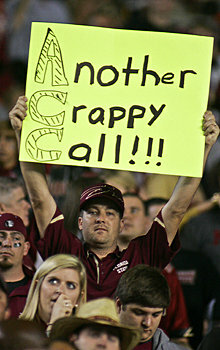 Evidently the Noles are not happy about the new ACC deal with ESPN for a 15-year, $3.6 billion agreement that sure sounded good in the press release. Each school was supposedly getting an additional $4 million a year. The average would be $17.1 million annually. But when the details emerged, it wasn’t as good as it looked and evidently most schools were grumbling. Florida State acknowledged this spring running an operating deficit and looking to trim up to $2.4 million a year in expenditures. The Noles are stuck with what they consider a less-than-desirable football schedule as they try to lure 80,000-plus to the Panhandle. The addition of Syracuse and Pitt to the league slate won't help that problem for a program surrounded by cash-rich SEC schools. FSU has a big enough football stick to attract suitors, so stay tuned.